After having lived the past year in the pulse of San Francisco’s Chinatown, I feel as if I have just participated in either a dare or an experiment. It’s a long story as to how I ended up at this residency hotel that I called home for the past year. 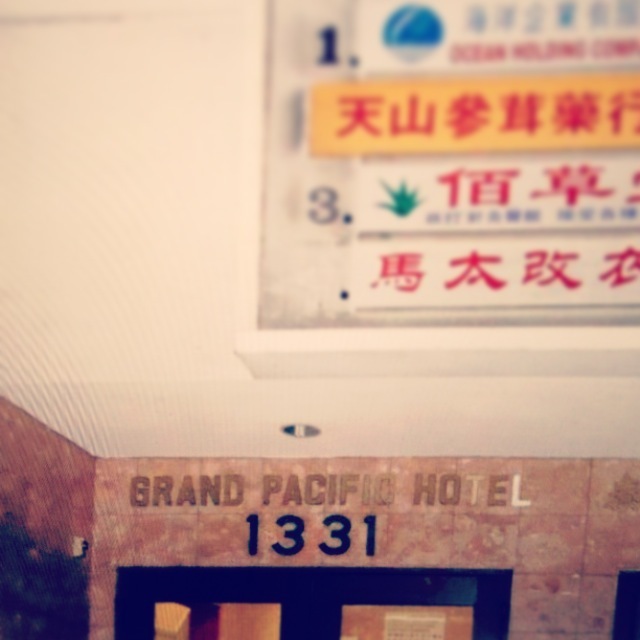 It is disguised by name as the Grand Pacific Hotel. It is neither grand nor located on Pacific Street and I am still uneasy considering it a hotel since the place seems only to house people in a long-term-permanent-home manner, there’s nothing temporary or fleeting about its occupants. Before I continue, please cast aside any preconceived notions that you may have about hotels or residences as they may fool you into thinking I had my own toilet, shower, or kitchen or that a maid service turned down my bed each night and left small squares of chocolate on my pillows. This indiscernible building, located on Stockton Street between Broadway & Vallejo Streets, is located in arguably one of the most active hubs of Chinatown. The entry is nestled between Yee Cheong Hardware and Asia Mall and directly across the street from Chinatown’s Walgreens. The exterior is a terra-cotta-colored brick spotted with small windows and lined with fire escapes. Homemade clotheslines are stitched into this façade and garments can be seen hanging to dry from nearly every window, in constant rotation as the dry are retrieved and the wet immerge. The entrance consists of a set of heavy-duty doors that lock between the hours of 8:00pm and 8:00am. Once inside, you can opt for the stairs on the left or the yellowing fluorescent filled old brown elevator that climbs floors so slowly you’d be better off taking the stairs. There is a sign next to the elevator that claims the building was seismically retrofitted in 1992 per California State Law in the event of another large earthquake (the last big one to hit was in 1989). You’ll notice the wall color first, best described as an asylum green from the waist down, where the molding is. The top half is white including the ceilings, which are higher than one might expect. The second floor is the site of the building manager’s office, which has a barred window facing a landing. Inside, you will usually see a very old Chinese woman who speaks no English sitting on an old fold-up chair in the corner, surrounded by filing cabinets and piles of paperwork. On occasion, you will see Karen, a younger Chinese lady who is infinitely friendly and enthusiastic and speaks more English than her older counterpart. You will sometimes see Mr. Wong, the kind Building Manager who speaks less English than Karen but more English than his elder. My little unit, #405 (pronounced suh-ling-woo), was on the fourth out of five floors, half the size of the ‘biggest’ units they offer. It was a ‘cozy’ ten by ten foot box that included a small sink in one corner, a hardly larger closet in another corner, and a small sliding window that overlooked the gap in the middle of the building: a concrete pit. Another resident once asked me whether I lived “on the perimeter or in the vortex?” When I told him “the vortex” he made an expression with his face that could only be mistaken for somewhere between a grimace and a look of pity. I, however, didn’t mind living on the inside circle of this structure. There was something safe and anonymous about it. 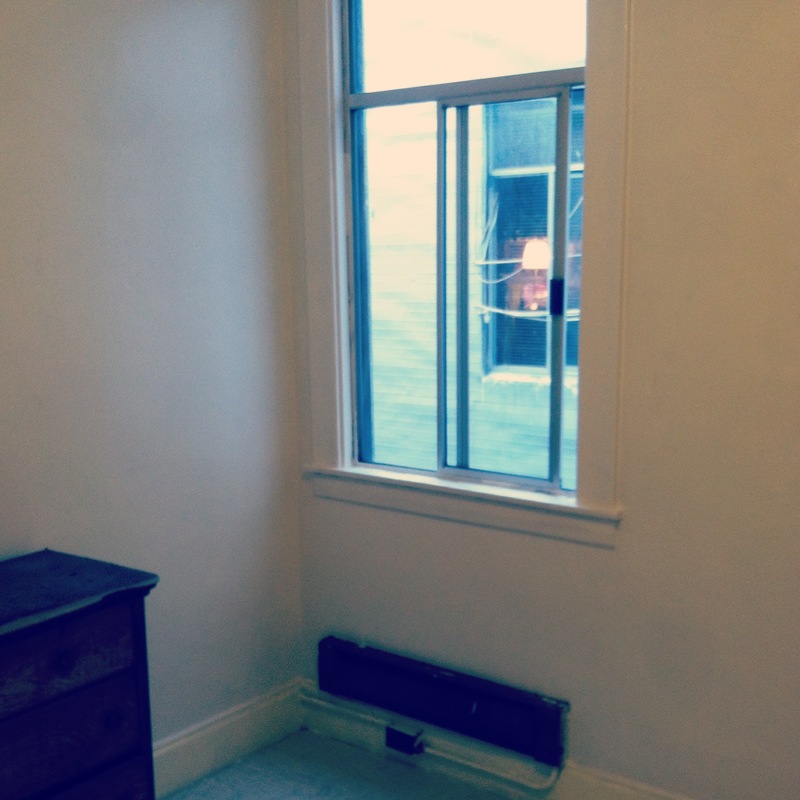 It felt more private, too, since I didn’t have a window facing the bustling streets below. My room was well insulated from the sounds of the city and though I had expected the air to be more stagnant and warm since it faced a cement hole, it wasn’t. I received many a good breeze and gust of wind through my narrow window. Moreover, the four concrete walls of the pit served as an acoustic playground and I could hear the sounds of my fellow vortex dwellers. At the time, those sounds regularly served as a much-needed reminder that I wasn’t alone. A neighbor’s television, children’s chatter, and the resident who played Led Zeppelin covers on his guitar: they all became part of my Chinatown orchestra. There were bodies swarming around at all times of the day. Only four thin walls and 100 square feet of space separated me from the continual ebb and flow of that energy; it swirled like a perpetual dust storm in the halls, kitchens, and bathrooms. My room was just two doors down from one of the two kitchens on my floor, a space filled with eight dirty electric burners, an industrial sink, and small cockroaches. The sounds of chopping on blocks drifted into my room regularly, as did the smells, which would range from an-almost-pleasant fresh steamed rice to a potent gag-worthy fishiness. 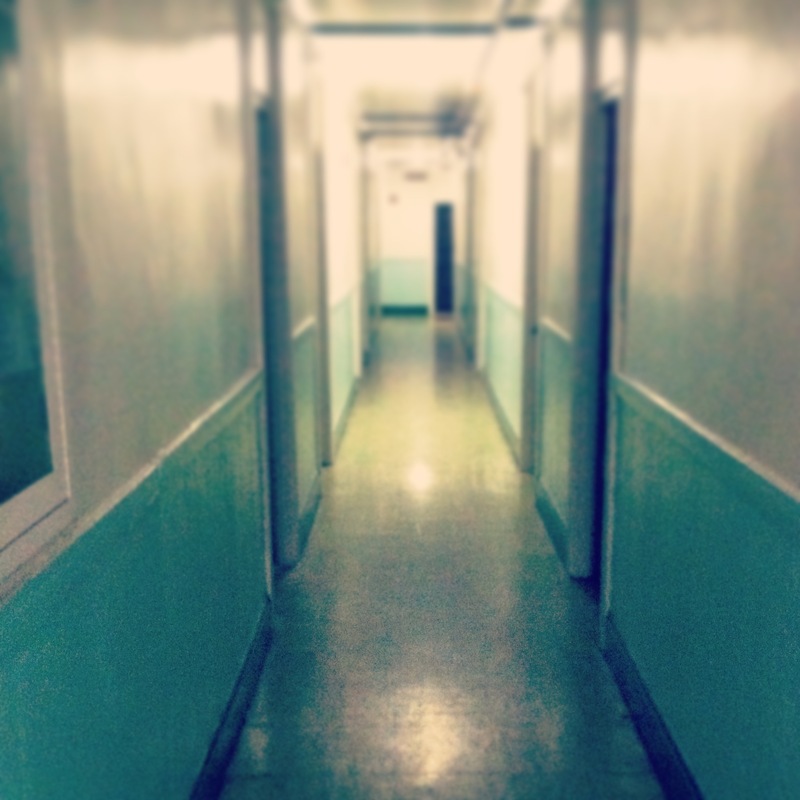 The various odors would change directions with the wind in every hallway you walked down and every floor you visited. It felt like an olfactory adventure twenty-four hours a day, though I rarely enjoyed any of it. 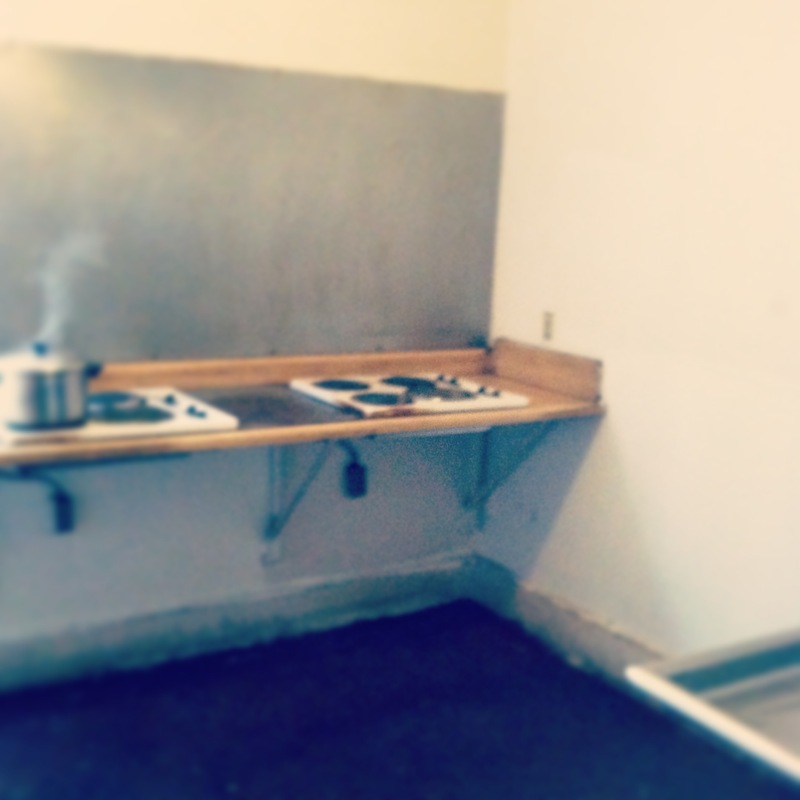 The kitchen was usually crowded and so filthy that I never once made a meal in it. I limited my time in the kitchen to the mornings, when I would use one of the eight burners to heat a tin full of hot water for my instant coffee. I do not care for instant coffee, but for someone who had no fridge and feared dirtying more than was necessary (cockroach phobia), it felt like my best option. The single worst experience I had in that kitchen happened around eight o’clock in the morning one weekday. I’d been stirred awake before my alarm had sounded for work by a scream so shrill I actually worried there was a child in danger. With some hesitation, I immerged from my room with tin in hand to heat my water. I entered the kitchen to find four or five residents crowded by the sink, chatting feverishly in Chinese. I thought little of this spectacle as my neighbors often used the kitchen as their common area for socializing and conversation. When I returned five minutes later to retrieve my now boiling water, I was witness to the beheading of the live chicken in the sink they had all apparently been gathered around. Blood sprayed the walls by the sink and I quickly realized that the sound I had heard earlier belonged to that of a squawking panicked chicken. I padded quickly away back to my room, trying not to appear ruffled (pun intended) and tossed my hot water down the sink, fearing that some blood may have landed in it during the commotion. From that day forward, like when crossing a street, I always looked both ways before entering the kitchen.